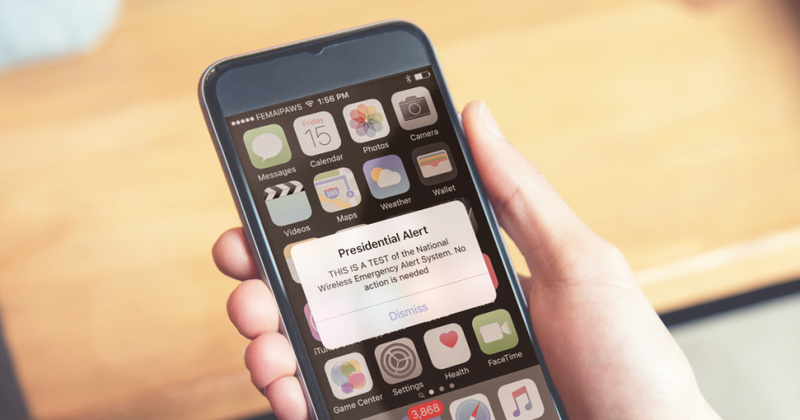 You can ignore President Donald Trump's frequent tweets as much as you'd like, but at 11:18 a.m. Pacific time this Wednesday October 3rd, your cell phone will pulse and buzz with a Presidential Alert. It's the first nationwide test of the Wireless Emergency Alerts system that sends urgent public safety messages to your cell phone in times of crisis. It would be used to alert the entire nation to a terrorist event, or some other emergency that affects the whole population. And yes, it will use the same jarring beep tone as other alerts (here it is in all its glory, in case you've missed it). Kate Hutton, Los Angeles city emergency management coordinator, emphasized it's strictly for use in extreme circumstances. "A Presidential alert is never going to be a 2 a.m. missive from the president about any sort of issue on the news. It's going to be definitely a national level emergency." The emergency alert test message was originally set for delivery at 11:18 a.m. Sept. 20, but a real emergency intervened. First responders on the East Coast were too busy dealing with flooding after Hurricane Florence. So the test was delayed to Oct. 3. Why can't I block this alert? You can thank your mobile phone carrier for that. Following a 2008 law (more on that below) the big mobile phone companies volunteered to partner with the FCC and FEMA to put emergency messages on your phone. Presidential Alerts cannot be silenced or stifled, Hutton said. Even if you turn your phone off, when you switch it back on, the alert would still be there, if it hadn't already expired. Can I block the other alerts I get - asking me to look out for a specific car or something? State and local governments send lower levels of alerts, such as the Amber Alerts about missing and abducted children that come from the California Highway Patrol. They are targeted to specific areas so that they reach the most relevant people. Hutton says you can disable those alerts, although she doesn't recommend doing that. For an iPhone, go into Settings, then Notifications, scroll to the bottom to Government Alerts and toggle them on and off. For Android phones, it depends on what phone you have. But you can find the info here.. Didn't I see #OptingOut trending when this test was first announced? Yup. The spectre of a presidentially-directed alert blasting from your phone got some people tweeting the hashtag #OptingOut. CNN media correspondent Brian Stelter said the description of the nationwide test as a Presidential alert was problematic because so many people distrust the president. And anti-Trump celebrities got in on the panic-mongering, like Bette Midler. Fox & Friends got it right though - no, you can't opt out. Hutton said she is disheartened that the national test took on a political tone. "It's a really important system, regardless of who's president and behind the desk," she said. "We really hope that people take a step back and look at it as part of the broader picture, part of their own public safety, what's going to keep them safe in an emergency." Haven't we always been able to get alerts on our phones? It's a fairly recent phenomenon. Emergency alerts have long been issued through television and radio. But mobile phones have only been receiving wireless alerts since 2012, in response to the 2008 Warning Alert and Response Network Act (WARN is the somewhat tortured acronym). It lets wireless phone companies voluntarily include their customers' phones in receiving alerts. The partnership includes major phone carriers, FEMA and the FCC. The FCC says the Wireless Emergency Alerts system has been used more than 36,000 times to warn the public at a less-than-national scale. Some are those Amber Alerts concerning missing and abducted children. Others alerts include weather hazards and assorted imminent dangers, like a chemical release, terrorist incident or dam break. The alerts can come from authorized national, state and local governments. They go through FEMA's Integrated Public Alert and Warning System to wireless companies, which put them out to our phones and other mobile devices. Find out more information about the alert system from FEMA and the FCC. Didn't something like this go badly wrong in Hawaii? The warnings can misfire. The entire state of Hawaii was, falsely it turned out, warned of an impending missile strike in January, generating widespread fear. The FCC called it "an alerting drill gone awry." Here's the FCC investigation into the incident. Also, state and local authorities sending messages through wireless carriers' systems sometimes reach too many users. Earlier this year the FCC passed a rule that takes effect next year that requires messages to not overshoot their targeted audiences by more than one-tenth of a mile.